Benjamin Lewin MW, Wine Myths and Reality. Vendage Press, 2010. They say that you shouldn’t judge a book by its cover (or a wine by its label? ), but does weight offer any clue to quality? Some winemakers apparently think so — they put their best wines (or at least their most expensive ones) in the heaviest imaginable bottles to give them physical heft to match their presumed sensory impact. If you take Benjamin Lewin’s latest book as a sample of one, intellectual heft and physical weight are pretty highly correlated, too. At 634 pages and 1.9 kg this is indeed a weighty tome — and a very valuable one for anyone really interested in wine. Wine: Myths and Reality is a great book for people (like me) with a geeky interest in wine. I like it so much, in fact, that I am going to make it required reading for the students in my university class, The Idea of Wine. They may not appreciate having to carry it around in their backpacks, but I guarantee they will thank me when they sit down to read it. I was tempted to title this post “Dr. Lewin’s DIY MW.” As I was reading the book I couldn’t help thinking about the Master of Wine exams and how closely the book seems to follow the syllabus. (I found a copy of the 2008/09 syllabus on the MW website — click here to view the pdf file). I am sure that reading Dr. Lewin’s book isn’t adequate to pass the MW exam, but I think it gives you a sense of the depth of knowledge that Masters of Wine are expected to master. The Master of Wine was invented to help educate and prepare wine professionals — people who make their living in the wine business as buyers, sellers, advisors, writers and critics. The exam’s structure reflects the need to understand not just wine but its entire commodity chain. The first two papers deal with the production of wine. 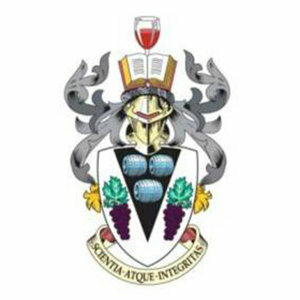 Paper 1 will examine candidates’ knowledge and understanding of ‘Characteristics of the vine and wine’ up to and including ‘alcoholic and malolactic fermentation’. Paper 2 will examine candidates’ knowledge and understanding of ‘Wine maturation, blending and bottling’ up to and including ‘quality assurance and quality control’. The first half of Dr. Lewin’s book does a rather masterful job of covering the material for the this part of the exam. Clear, organized, detailed, interesting and provocative — just what the doctor (or aspiring MW) ordered. Theory Paper 3: The Business of Wine. The purpose of this unit is to assess candidates’ current knowledge and understanding of financial, commercial and marketing aspects of the international wine industry. Candidates should demonstrate the ability to apply their knowledge to a range of business situations including marketing and investment strategies, financial decision making, supplier – customer relationships and strategies for identifying and meeting consumer demand. Candidates will require a broad background knowledge of wine industry structures around the world and how these relate to one another. I have argued in the past that the Masters of Wine program was been very important to the development of the global wine market by its efforts to create a highly trained group of industry leaders. Reading Dr. Lewin’s book you can understand why. Dr. Lewin is not quite as comprehensive in this part of his book, which is understandable since this material will be of less interest to a general audience, but his analysis of global wine market trends and issues is still very interesting and useful. The fourth MW essay is on “contemporary issues” and I think Dr. Lewin does a great job of raising and analyzing important issues throughout the book. As someone who writes and uses textbooks all the time, I appreciate that Dr. Lewin provides us with his opinions (not playing the old “on one one hand, on the other hand” game), but he does so carefully, citing evidence after having outlined the issues clearly. The final third of Dr. Lewin’s book is a world tour — an introduction to the regions, the wines and the relevant controversies, with special focus on Burgundy and Bordeaux, which is understandable given their place in the world of wine and especially because of Dr. Lewin’s particular interests and expertise. I was initially surprised by the organization of the regional wine survey chapters. Traditionally the Old World comes first and the New World trails along behind. Dr. Lewin reverses the order. Why? I believe that it has to do with the theme of the book. 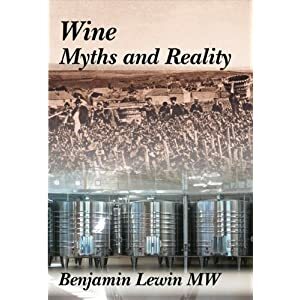 The title, Wine Myths and Reality gives a strong hint of the book’s over-arching argument. The myth is that Old World wines are unmanipulated natural products and that New World wines are highly processed industrial ouput. Dr. Lewin argues throughout the book that all wine is manipulated — how could it be otherwise? Left to itself, wine is just a stop on the liquid road to vinegar. It is hardly surprising that Benjamin Lewin would take this stand on wine. He is a renowned cell biologist who understands better than most the role of science in wine. To dismiss “manipulation” is to ignore wine science, which seems like a foolish, ignorant attitude. Embracing Dr. Lewin’s argument raises the true question — what do we want wine to be and how best can we achieve this goal? Everyone manipulates (or else makes spoiled wine) — the question is how, how much, why and to what effect? Telling the story of the New World first puts this argument in context and highlights the real issues effectively. This is a very fine wine book — one of the best I’ve read — and certainly worth a place on your bookshelf — even if you have to reinforce it to bear the extra weight! This book’s color illustrations — maps, photos and graphs — are simply excellent. I think one reason the book weighs so much is that it is printed on special high gloss paper to make these illustrations unusually clear and useful. Maybe one for the Kindle? Great thought! Does the Kindle display full color? I wouldn’t want to miss those great maps, photos and charts. Is this a vanity press book? I believe that it is self-published, but I think it is a mistake to call it a vanity press effort. Jancis Robinson wrote a piece in the Financial Times last year about the trend towards self-publication of quality wine books. Here is the link if you are interested.